What is Kid’s Eye Health? Children’s vision care is essential to every child’s development and there are special considerations. The healthy development of your child’s eyes and vision is critical to their well-being. Your child should have an eye examination every year. A routine eye exam will help with the early detection of vision problems and eye diseases. How Do You Know If a Child Has Eye Problems? When Should You Test a Child’s Vision? Your child should receive an eye examination every year, or more frequently if specific problems or risk factors exist, or if recommended by your eye doctor. Unfortunately, parents and educators often incorrectly assume that if a child passes a school screening, then there is no vision problem. However, many school vision screenings only test for distance visual acuity. A child who can see 20/20 can still have a vision problem. In reality, the vision skills needed for successful reading and learning are much more complex. They show any of the signs or symptoms of a vision problem listed above. They are not achieving up to their potential. They are minimally able to achieve but have to use excessive time and effort to do so. Vision changes can occur without your child or you noticing. Therefore, your child should receive an eye examination every year, or more frequently, if specific problems or risk factors exist, or if recommended by your eye doctor. The earlier a vision problem is detected and treated, the more likely treatment will be successful. How Do You Test Children’s Vision and Eye Health? Did you know that 5% to 10% of preschoolers and 25% of other students have undiagnosed vision problems? Your child should receive an eye exam every year to ensure early detection of vision problems and eye diseases. Early treatment in children is very effective. 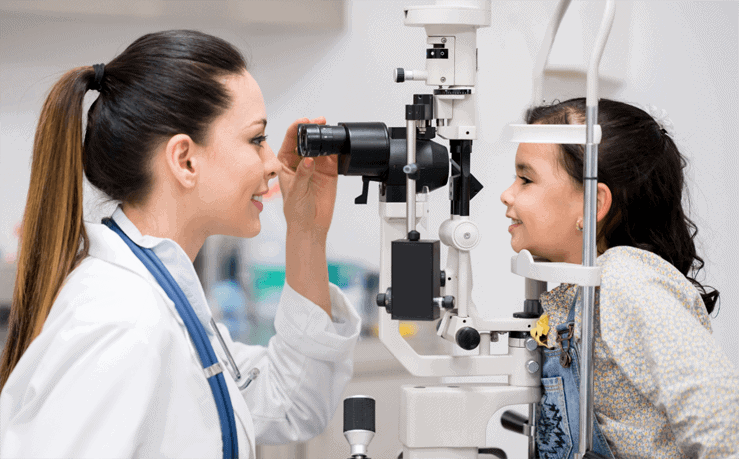 In the states of Missouri and Illinois, children entering kindergarten or enrolling for the first time in public, private, or parochial elementary school are required to have a comprehensive eye exam performed by an Optometrist or Ophthalmologist. Eye exams generally include evaluating family and medical history, testing of vision and eye alignment, and an eye health evaluation. The specifics of how exams are conducted depend on the child’s age. For children who can read, the test is similar to that of adults. While covering one eye, the child is asked to read letters on the Snellen eye chart located ten feet away. For children who cannot yet read, your eye doctor may use a chart of LEA symbols rather than letters. These symbols include an apple, square, circle, and house. A random dot stereopsis test uses 3-D glasses and special patterns of dots to determine who well your child’s eyes work together. To determine your child’s eyeglass prescription, your eye doctor may use a retinoscopy test in which s/he shines a light into the eye to observe the reflection from the retina. Infants should be able to see color, depth, and focus just as well as an adult by six months of age. To evaluate your baby’s eye health, your doctor may test pupil response by shining a light towards the eyes. The fixate and follow test determines if your baby can follow an object as it moves. Typically, infants as young as three months are able to fixate on an object and follow it. Your eye doctor may also use striped cards in a preferential looking test to attract the gaze of a baby and assess her vision capability.